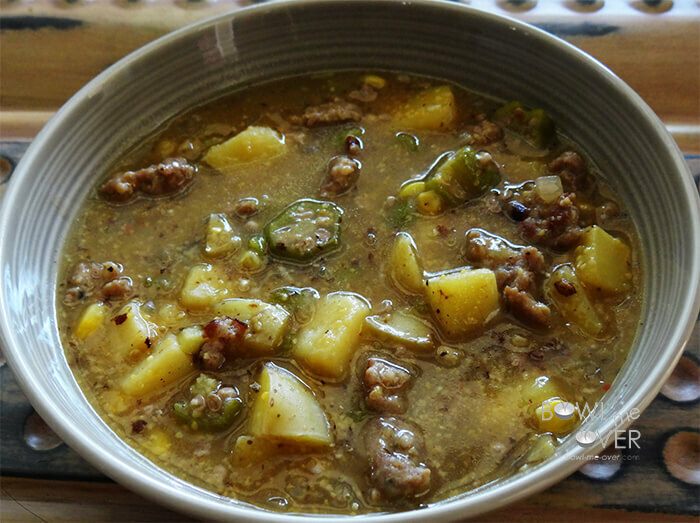 Sausage and Okra Stew is a fusion of Italian and American flavors. It is a delicious combination of polenta and Italian sausage, paired with fall harvest flavors like potatoes, okra and corn. This stew is rich, thick, hearty and delicious! This post has been updated from August 2016 to improve reader experience. Okra… love it… or hate it? Never tried? Ahhh yes! That’s who I’m looking for! Someone without preconceived notions of okra. You know I’m kidding, right? I confess – until I moved to the valley, I had never tried okra either. Once I tried it though I was hooked. It has an earthy flavor and a bright crunchy texture. Fried okra, YUM! Sausage and Okra Stew? Delicious! In this soup, the okra is coated with polenta and together they make a rich creamy soup. Did you doubt me? Seriously, this is rich and hearty – all you really need is a great loaf of crusty bread to sop up all this amazing broth! This stew is a fusion of delicious flavor! I’m going to address the elephant in the room because I know what you’re thinking. Okra is slimy. True or not, Deb? Deep fried or stewed, once it’s cooked the texture is a non-starter. In this stew, the okra is coated with polenta. It’s a crunchy bright flavor. The polenta thickens the stew and when it’s mixed with the sausage? This one is dynamite! How do I clean okra? For this stew you will run it under cold water. Slice off the stem and discard. Slice the okra into 1/4 inch slices. If you are deep frying the okra you’ll want to soak it in a vinegar brine for 30 minutes. Drain well and dry completely before frying. Are okra seeds safe to eat? Can you eat the whole okra? I eat everything except the stem. Brown the sausage over medium heat in a heavy bottom pot. While the sausage is cooking, slice and dice the vegetables and mince the garlic. Drain the oil from the sausage and add in the okra, potatoes and onions. Increase the heat to high and add the chicken broth, bring to a boil. Stir well scraping the brown bits from the bottom of the pan. Reduce to simmer and cook for another 20 minutes, stirring occasionally. The stew will thicken and once the potatoes are cooked through, add the frozen corn and stir. It only takes about a minute to heat through – enjoy! It only takes about 45 minutes from start to finish to make this stew. This is an easy weeknight meal! More hearty stews I know you’ll love! I hope I’ve talked you into trying it! This recipe makes a nice big pot of stew, enough for 6 generous portions or 8 healthy bowls. Plenty for your family – and if you don’t say anything about the okra, they won’t even know, right? Enjoy! 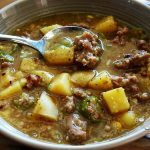 Rustic Harvest Stew - delicious, rich and hearty - all you really need is a great loaf of crusty bread to sop up all the broth! While the sausage is cooking, chop the okra, onions, potatoes and mince the garlic. Drain the excess oil from the sausage and add in the okra, potatoes & onions. Sauté for about 4 minutes and add the garlic and polenta. Mix well, seasoning with the salt, pepper and red pepper flakes. Increase the heat to high and add the chicken broth, bring to a boil. Stir well scraping the brown bits from the bottom of the pan. ! Reduce to simmer and cook for another 20 minutes stirring occasionally. Add in the frozen corn once the potatoes are cooked thru. The stew will thicken as it cooks. When the potatoes are fork tender, the stew is complete. Enjoy! I love okra and I think this stew looks like a delicious seasonal dish! Big fan of okra myself, thanks Amy! I love one pot meals. They always make the best Sunday dinners… Pair this amazing stew with homemade bread and there you have it! Nailed it! Great crusty bread – meal made in heaven! Thanks for stopping by Katie! I am so looking forward to autumn and the food that comes with it! 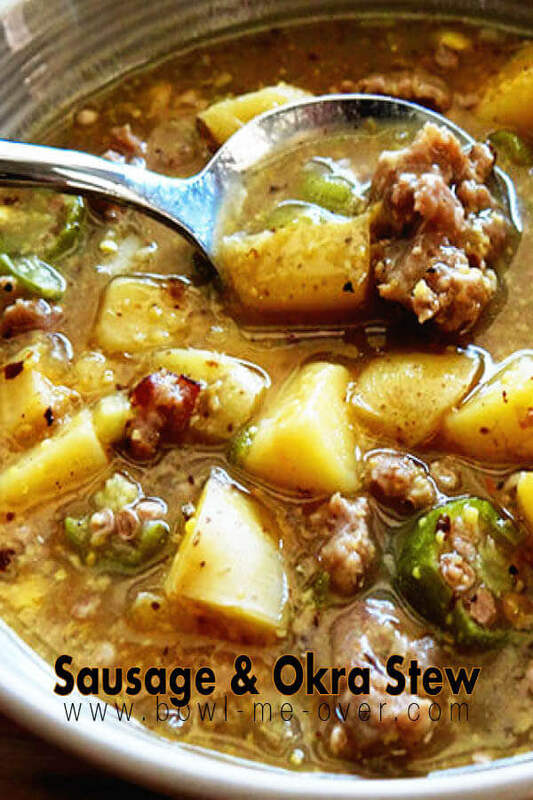 Stew is one of my cold weather favorites, this sounds delicious! Thanks Marye – cold weather is just around the corner! What an amazing looking stew! So hearty and inviting. Thank you for sharing this!! You bet Levan – Thanks for stopping by! This looks so good. I will be making it the first chance I get. Yum!! Awesome Lois, please let me know what you think! Hi Debra! Thank you for your kind words over at my blog 🙂 I popped right over to yours and this gorgeous bowl of stew greeted me – rustic, full of flavor and rich! Wish I had a bowl right now. It’s still kinda chilly here in Buenos Aires as we transition from winter to spring…. this stew would do me much good! Thank you Felicia – I really enjoyed reading your blog. I can really relate – we have one family member that just lost their battle with cancer and one that is fighting the fight. My thoughts and prayers are with you. Seriously I am shocked your hub didn’t go back for a third bowl at midnight. I would! YUM!!!! You bet Kathryn – thanks for hosting such a great party!!! This is a fantastic combination of ingredients, it looks amazing! Thank you so much Justine!! Oh Wow!! This looks amazing!! I will definitely be trying this one soon! 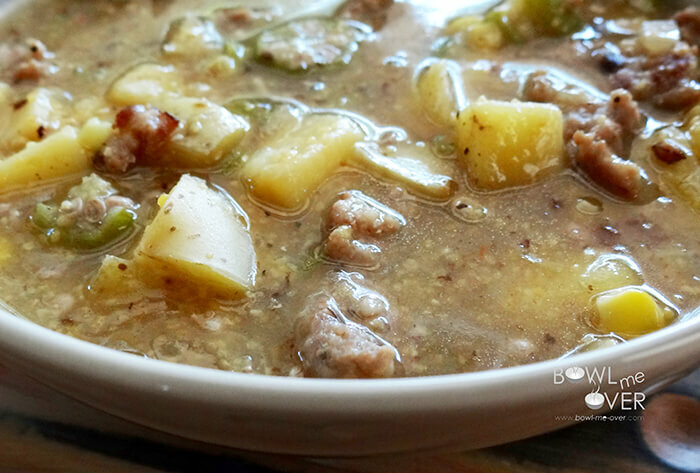 You’ll enjoy this Rhoda – easy, yummy stew! What a great recipe. I’m definitely going to make this over the weekend and pop it into the freezer for a quick midweek dinner. Thanks! Great idea Lucy – I do that with all my soups! Makes life so much easier when you don’t feel like cooking. Unfortunately it is time to start thinking about fall vegetables. This is the perfect start to the season. I am craving lovely fall dishes like this! Me too – it might be hot outside, but a great bowl of stew is so warm & filling. recipes like this are what i grew up on! When I saw you post this on facebook my mouth was literally watering… love this recipe! This sounds so good! I love okra and potatoes, and it looks like rain today, so that’s a good enough reason for soup, right? I’m a huge fan of polenta, but have never tried it in a stew, this sounds wonderful! It was perfect to thicken the stew. Oh, this looks awesome. I’m def. trying this when the cooler weather hits. I love using sausage in soups. I’ve never actually tried okra but I’m willing to give it a shot. Great – let me know what you think Christine! Delicious harvest stew love to do a taste test, thanks for sharing with Hearth and soul blog hop, pinning. Thanks Sandi, love this stew! I spy okra. I love okra. This looks hearty and delicious. That it is – love this soup! What a perfect bowl of comfort! Love it! Perfect for fall – I hope you give this a try Serena! OH my gosh, yum! I can’t wait to try this. Pinning it now! Omg!! This stew look amazing and delicious too. I can’t wait to try it. We are a turkey family so I’m going to do a little twist by using turkey Italian sausage. I hope it turn out good. Thanks Jennifer, turkey sausage will be just as amazing, that’s a great substitute – enjoy! If you get a chance, swing back by and let me know what you think of this recipe!! Really yummy! I used the turkey Italian sausage which may be a little saltier than others. Low sodium broth next time. I didn’t see where to add the corn, so I added it the last 5 minutes. Came together fast and easy. My kind of recipe. So glad you enjoy this stew Lynn and thank you so much for letting me know regarding the recipe, I’ll update it right now!! I love okra! I grow, harvest and use it fresh as long as I can in our climate, which is quite a while unless a hurricane kills it with blowing salt water. I cook it fried, stewed with tomatoes and onions, in soups, stews and gumbos. One thing I have learned after many years is this! Unless you are using Okra as and ingredient and thickening agent in a dish, you must cook it first to remove the “slime”. Cooking it first does not remove the subtle flavor nor the texture. Here’s the way I do it: Slice it and toss it into a frying pan with a little bit of butter or olive oil. Have the skillet on medium low heat. Cook and stir the Okra until the “slime” is gone from it. Then you can add it to any recipe that calls for Okra. That’s my way but ya’ll can come up with another technique if you wish! I’m an okra lover too, so your info is super helpful Mike, I appreciate all of your tips and tricks!!! Yes – in this stew Okra as an ingredient and thickener is just perfect! This is so tasty! what do you mean………..2 pieces of potato? I’m sorry Dan that should read two potatoes. Updating! !